Top Speed: 65+mph All-Out, 50+mph Out of the Box! We built the E-Revo for 6S brushless power right from the start. For other companies, brushless ready means just making some nominal provisions for battery and motor installation and letting the aftermarket develop the upgrades necessary to make it survive. Not Traxxas. We heard the call for more power so E-Revo was tested tough for durability with brutal 6S LiPo power and intense custom wound brushless motors. For the uninitiated, this extreme 65+mph motor and battery combination is ordinarily a predictable recipe for a box full of twisted and mangled parts. Not so with the E-Revo Brushless Edition. E-Revo’s driveline has been engineered to endure the kind of horsepower and punishment that’s possible with today’s motor and battery technology. It looks factory because it is factory, complete with a separate motor plate for clean, low-slung single motor installation. 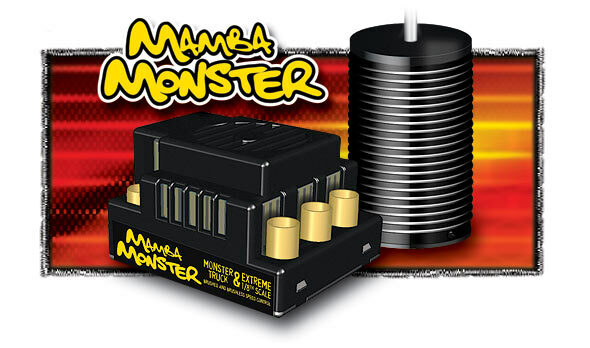 Built specifically to handle the rigors of large, power-hungry trucks, the Mamba Monster speed control is ready for 6S LiPo power with its massive 6.5mm gold-plated connectors, high-efficiency heatsink, integrated cooling fan and heavy-duty components. The speed control sends its power pulses to a Castle 2200Kv 75mm motor, designed specially for maximum performance and reliability with 6S LiPo power in torque-hungry applications. The aluminum motor can is machined to act as a massive heatsink, high-grade bearings deliver maximum efficiency, and high-strength Neodymium magnets give E-Revo Brushless Edition outrageous torque. To resist the twist, a beefy 5mm shaft transfers power to Brushless-Ready transmission. The E-Revo Brushless Edition now includes the Traxxas TQ 2,4GHz High Output Radio with Traxxas Link. This new system offers the unbeatable convenience of “no channels, no crystals” 2.4Ghz technology, and the long-range security of a high-output signal—but that’s just the beginning. The new, patent-pending Traxxas Link technology stores settings for up to 20 Traxxas Link-enabled models, with no naming or “model memory” settings required. Just power up the transmitter and the model you want to drive, and the settings for that model are dialed in immediately! The new TQ 2.4GHz High Output radio is also fully adjustable; steering and throttle end points can be set precisely, and the Multi-Function knob can be programmed to control Steering Sensitivity (Expo), Throttle Sensitivity (Expo), Steering Percentage (Dual Rate), Braking Percentage (Dual Rate), or Throttle Trim. Engineered by Traxxas, the ground-breaking molded E-Revo chassis sets a new benchmark for electric monster truck looks and performance. The E-Revo chassis combines art and function to deliver a lightweight, integrated, and rigid platform that maximizes strength and reduces weight. Scalable battery compartments accept a variety of NiMH and LiPo configurations to unlock E-Revo Brushless edition's power potential. By combining the battery compartments with the chassis design, the battery packs can sit low and close to the center of the truck, plus valuable chassis surface is freed up to accommodate the electronics for a clean layout. This keeps the center of gravity (CG) as low as possible and increases side-to-side agility by keeping most of the weight close to the center. Resembling the exhaust ducts of a turbine powered jet, the futuristic battery vents are securely mounted on the chassis. In addition to offering entrance and exit cooling, the oversized openings incorporate latches that insert into the battery door clasps. The battery compartment vents symbolize the sleek and high-tech image that places E-Revo in a class of its own. The futuristic chassis design incorporates enclosed battery compartments into the sides of the chassis for an ultra-clean look even with the battery packs installed. Innovative quick release battery doors mount directly to the chassis, so there are no clips or hold downs to lose during battery swaps. The doors pivot down using a hinged design and dual clasps secure the tops of the battery doors for impact-proof security. To open the battery doors depress the latches and pull on the battery door tabs. To close the doors simply press on the door until the latches snap into place. Keyed, adjustable L-braces located inside the battery compartments allow the battery packs to be positioned in multiple incremental positions from front to rear for precise weight bias tuning. A top mounted, spring loaded clip holds battery packs securely at the lowest point to keep the CG as low as possible. E-Revo takes a total system approach to eliminating the slow, mushy steering response typical on other monster trucks. Each servo is rated for 125 oz.-in. of torque, giving E-Revo a total of 250 oz.-in. of tire-turning twist to keep you in command no matter how tough the conditions. There is no other electric monster truck like E-Revo. It embodies the highest level of creativity in design and engineering skill to create the absolute best in monster truck performance. E-Revo is the benchmark that could only come from Traxxas, the leaders in innovation and design. MODEL 5608: Fully assembled, Ready-To-Race®, with TQ™ 2.4GHz High Output radio system with Traxxas Link™, Castle Creations Mamba Monster Brushless System and ProGraphix® painted body. Traxxas introduces the next generation of 2.4GHz radio system performance and it's available now in the E-Revo Brushless Edition. The new Traxxas TQ 2,4GHz computerized High Output radio systems are equipped with superior Direct Sequence Spread-Spectrum (DSSS) technology, fully programmable features, and the convenience of patent-pending Traxxas Link™ automatic model recognition. Forget about crystals and frequency conflicts! The transmitter's easy-to-use design provides the instant, worry-free, turn-it-on-and-go driving fun you expect from Traxxas, while also delivering a full compliment of pro-level tuning features for those who wish to explore the expanded tuning possibilities. The Multi-Function knob on the face of the transmitter can be programmed to control a variety of functions such as steering exponential, steering and braking dual rate, and throttle trim. Access is through a simple menu tree controlled by a two-button interface. Other tuning options include end point adjustment, servo reversing, and sub trim adjustment. Top-level performance is what you expect from Traxxas, so the new TQ 2.4GHz High Output pumps out a strong, clear signal for optimum range. The 13ms frame rate and near zero latency results in instant steering and throttle response along with precise, smooth control. The exclusive Traxxas Link™ automatic model recognition software is a breakthrough in "model memory" that makes it easier than ever to enjoy multiple Traxxas Link enabled models without juggling transmitters or scrolling through complex menus searching for model names. Each time the transmitter is bound to a new receiver, it saves that receiver in its memory, along with all the model settings assigned to that receiver. The next time that transmitter and any previously bound receiver (up to 20!) are switched on, the transmitter automatically recalls the settings for that receiver. Just power up the transmitter and the model you want to drive, and the settings for that model are dialed in immediately! Up to 20 Traxxas Link enabled receivers and 20 Traxxas TQ 2.4GHz High Output transmitters can be cross bound together making it possible to grab ANY transmitter and ANY vehicle from the group, switch them on, and start driving. It's perfect for when you have lots of vehicles you want to drive but don't want to have to keep up with which transmitter belongs to which model. 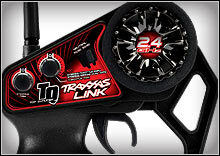 Traxxas Link does it for you, seamlessly behind the scenes. The TQ 2.4GHz High Output's micro receiver fits easily into any vehicle, and features dual channel-1 outputs for easy installation in vehicles with dual steering servos—no Y-harness necessary! The integrated LINK button makes it fast and easy to bind the receiver, and the two-color LED indicates power-on and bind status for fool-proof control and convenience. 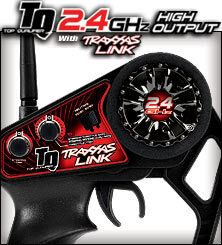 Traxxas Link allows the receiver to recognize up to twenty TQ 2.4Ghz Traxxas Link enabled transmitters—just switch on and drive. In the event of signal loss due to an accidental switch-off or depleted batteries, the receiver will automatically return the throttle to neutral and hold the last commanded steering position. The Fail Safe programming is built-in and does not need to be set or activated. This heavy-duty setup includes Castle's 2200kV motor for full 6S LiPo (25.2 volts max) combatibility, which gives E-Revo the ability to exceed 60mph with wheel-lifting torque and brutally quick acceleration. 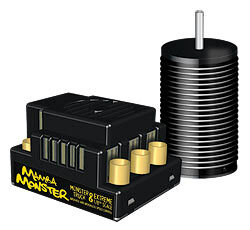 The Mamba Monster controller features a cooling fan and heavy-duty construction with oversized 6.5mm connectors to eliminate “thermaling,” and the motor uses a 5mm rotor shaft for added durability. 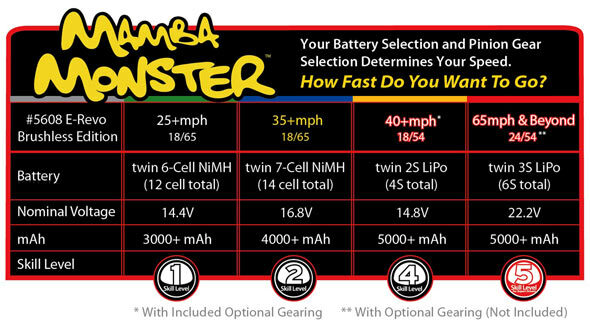 The Mamba Monster Brushless system comes equipped with two new Traxxas High-Current Connectors. Designed to handle high-current applications, Traxxas Connectors effortlessly funnel the dual battery's total power to the electronics keeping things running cool and at full capacity. Waterproof digital steering servos (2075) use O-ring seals to keep the fun going when things get wet. Twin digital high-torque servos provide the muscle to drive a single heavy-duty servo saver. Twin servos are lighter and more compact than a single large servo, and together they deliver unmatched monster steering response. The servo saver rides on ball bearings to keep the steering response smooth and precise. E-Revo Brushless Edition's 17mm splined aluminum hex hubs make certain its considerable horsepower is delivered directly to the treads. The splined design is extra strong with unsurpassed torque handling to resist twist-out no matter how hard the 2200Kv motor pulls at the tires. Traxxas Power Cell Batteries Included! E-Revo Brushless Edition includes two genuine Power Cell Battery Packs to make sure you experience all the performance that’s been engineered into your Traxxas model. Power Cell packs are optimized for free-flowing power and maximum punch with premium quality, low-resistance cells; flexible, silicone-jacketed 12-gauge wire; heavy-duty welded tabs; and Traxxas' high-output, gold plated, high-current connectors. Seven cell packs give E-Revo Brushless Edition 16.8 volts of motivation for maximum speed, and precision assembly with attractive, individually wrapped cells and clear overwrap complete the Traxxas Power Cell package. An Industry First! E-Revo uses an innovative solution for easy battery installation. Quick release battery doors snap open and closed in seconds for fast and easy battery installation. There are no clips to lose in the field and the potential for battery changes during pit stops opens the door for a whole new class of electric monster truck racing. The battery enclosures are vented with artfully designed intakes and exits to provide cooling air to the batteries. Nothing was overlooked in developing the ultimate electric monster truck platform. There is no more important single component than the chassis. The chassis construction and rigidity affect all aspects of how you interact with the model. From how it handles to how easily you can install batteries, the E-Revo chassis is both art, and engineering excellence. The smooth center skid plate is by itself a sight to behold while it protects and strengthens. Critical driveline components are shielded from the elements for long life. A cover provides access for maintenance. Careful attention to design raises torsional rigidity to eliminate chassis flex which contributes to E-Revo's stunning handling precision. The superior technology designed into the Revo suspension provides capability, performance, and tuning functions that are so far advanced they set the Revo specification at the absolute pinnacle of monster truck design. Dig into the details and you will see how E-Revo lets you experience precision and performance that's simply not possible with conventional designs. With multiple design patents pending, nothing else even comes close. The E-Revo's fully trimmed and painted ProGraphix body is available in Red, Blue, Red-Black, and Blue-Black. Decals are also applied to save you time and get you driving just minutes out of the box. Traxxas' ProGraphix bodies are the hottest looking bodies around and are only available on Traxxas Ready-To-Race® models. Revo architecture delivers the most suspension travel possible, tunable progressive damping rates, independent ride height adjustment, and the absolute highest level of control for any situation. The precision aluminum shocks are rigidly mounted to the chassis, protected from dirt, rocks, and crash damage. E-Revo's transmission design is skillfully configured to fit low in the chassis and to also keep the motor(s) mounted as low as possible. This consistent design theme contributes to the handling benefits derived from E-Revo's optimized center of gravity. An oversized steel idler gear and the patent-pending Torque-Control™ slipper clutch are built to handle the massive torque of high-performance electric motors. The new single-speed Brushless-Ready™ transmission features an oversized steel idler gear and a Torque-Control™ slipper clutch to handle the massive torque of high-performance brushless motors. To access spur and pinion gears quickly and easily, a unique single-piece gear cover can be removed and installed with a single hex screw. 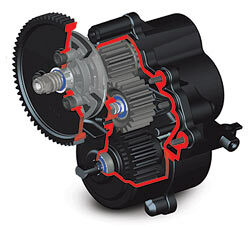 For additional tuning options an accessory single motor installation kit and two-speed gear sets are available. 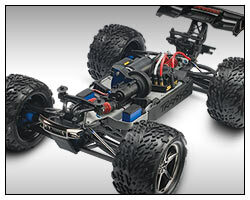 Automatically stores and loads settings for up to 20 Traxxas Link-enabled models—just switch on and drive, “model selection” is not required. MODEL 5608: Fully assembled, Ready-To-Race®, with TQ™ 2.4GHz High Output radio system withTraxxas Link™, Castle Creations Mamba Monster Brushless System and ProGraphix® painted body. the tray shape and design, the height and width of the battery must be decreased. MODEL 5608: Fully assembled, Ready-To-Race®, with TQ™ 2.4GHz High Output Radio with Traxxas Link™, Castle Creations Mamba Monster Brushless System and ProGraphix® painted body.